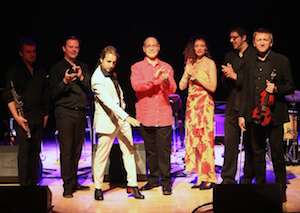 Following their memorable concert last year at Dean Street, then with many concerts up and down the U.K., this formidable ensemble return for another inspiring evening of castanets, hand clapping, evocative singing, flamenco dancing and captivating ensembles and solos from Spanish Accents. 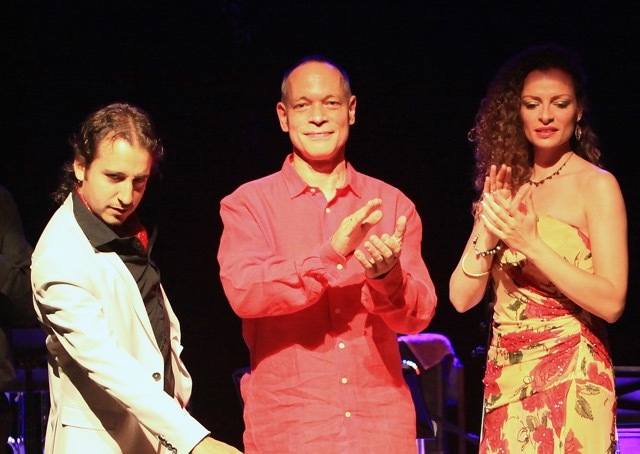 Led by the multi British Jazz Award winner Alec Dankworth, whose long-standing love of all things Spanish provided the inspiration for this group, the music of Metheny, Corea, even Rodrigo are reinvented alongside traditional folk songs and originals in flamenco rhythms creating a wonderful and genuinely Spanish world. The 7-piece band features the authentic Spanish voice of Graciella Rodriguez, lead singer with J-Sonics and the salsa inspired Roberto Pla Latin Ensemble, together with the flamenco dancing and palmas of Jesus Olmedo. They, along with a heady mix of top British musicians – saxophonist Mark Lockheart, Chris Garrick’s gorgeous violin, and Alec Dankworth’s bass interweaving with the genuinely Spanish drumwork of Demi Garcia and guitar of Chris Allard, promise a distinctive evening in this JBGB Events presentation.